What is trash fishing? Trash fishing is like regular fishing, but we fish for trash. It is a way to clean up our waterways and have fun doing it. What’s the goal of trash fishing? To find the most interesting stuff, haul it out of the water, and dispose of it properly. Trash fishing is part treasure hunt and part environmental cleanup. Who are some trash fishermen? Well, my son Mark, he’s 12, he’s the founder of Trash Fishing. This project was his idea. I’m Tom and I go with him. My friend Charlie is usually there and his daughter Jesse, she’s 8. Typically we get more people to join us. Anyone is welcome, we even have free tools you can use to help you catch trash. What tools do you use? Our most useful tool is probably a “Gripper-Grabber”, someone usually sits on the front of the boat and grabs the trash. If you bring a boat to one of our events this year, we have free Gripper Grabbers to give to you, so Trash Fishing is sorta free. Sometimes near the dock we try using a big magnet, but those only pick up steel items. We usually wear gloves of some kind because the trash can be a little gross. People have shown up with nets and shovels and rakes too. Whatever it takes to get the trash out of the water and into the boat, that’s what we do. How much trash is a good haul? You can measure it a few ways. If you are going by weight, 50 pounds per boat is a good haul. Or a full contractor trash bag is a good goal. There is a lot of trash out there. Is there a Trash Fishing Tournament? Yes! We are hosting 8 of them in 2019. 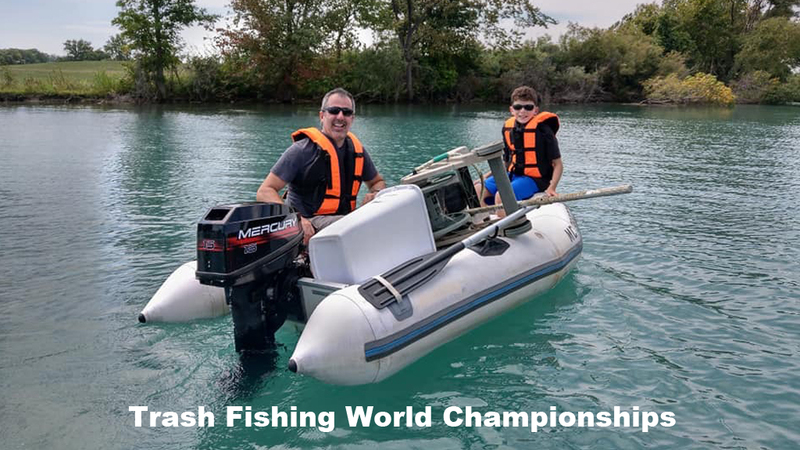 You can find the list of events here: https://www.facebook.com/pg/trashfishing/events Trash Fishing Contests are free to enter and you could win a prize for collecting the most trash, the biggest piece of trash, or the most unusual trash. So come join us. Is trash fishing hard? No! Unlike real fishing, you stay busy trash fishing. If you get in a honey-hole with a lot of trash, you can stay busy for the entire time. It’s fun to catch so much trash. Why do this instead of real fishing? Rather than catching a couple of fish you won’t eat, you can hunt around and pull 50 pounds of trash out of our waterways. It isn’t unusual to catch 100 pieces of trash in an afternoon. That’s a lot of fun. What unusual finds have you fished out of the river? Lots! The first piece of trash we ever nabbed was a waterski! We’ve also found a Coast Guard Buoy that was used to track dead bodies, a Canadian construction barrel, a hose reel cart, an electric scooter, underpants, buckets, a basketball, car tires (they float if they are still on the rim), lots of bottles and cans, bait containers, boat bumpers, and all sorts of other things. You really never know what you’ll find Trash Fishing! That’s part of the fun. What do you need to go Trash Fishing? Well, it usually requires a boat. Most of the trash is in areas that seem to require a motor boat of some kind. Not a big one, or a nice one, just about any boat with a motor will do. If you (or your friend) has an old boat sitting behind their garage that they hardly use, encourage them to come trash fishing. We stick together in groups, so if there is trouble it is easy to get towed back to the launch. When I started Trash Fishing Mark and I used a 9 foot long dinghy and Charlie had an 11 foot fold-a-boat. Definitely not yachts. Now we have Boston Whalers, which are really nice, but you don’t need to have anything so deluxe. Little boats are fine. Bring what you have. Row boat, fishing boat, bass boat, swamp boat, pontoon boat? We welcome all kinds. Are kayaks good for Trash Fishing? Some folks come with kayaks and those are welcome at many of the events, but you should be ready to be towed a bit by a motor boat. You’ll also need a good trash plan. You’re probably going to collect a lot of trash, so bring a good size bin, Paul brought his your curbside recycling bin. That was a good size. Be ready for rough water too. The Detroit River can be rough and it moves pretty quickly, kayaking against it can be an uphill battle. Usually a motor boat can tow a train of 3 or so kayaks, but even at a crawl in some areas you might get tipped over. Check the event description to see if kayaks are a good idea. How Do I Get Involved? First, follow us on Facebook. That’s where we update events, post interesting things, and plan everything. Facebook is much easier to update than this website and people use Facebook to connect with friends, so we do most of our planning over at Facebook.com/TrashFishing. Like the page, sign up as “Going” for one of our events. Then just show up to the event. Can Our Organization We Partner With You? Absolutely! Any organizations are more than welcome to partner with us. If you are having a river cleanup or a beach cleanup, let us know and we’ll try our best to show up. If you have a clean water initiative and you want some manpower, let us know. If you are doing some scientific research into water pollution and you want to ride along with us, contact us. We want to work together. There is a lot of trash to be collected. Do we need funding? Sorta! Last year we raised $1,500 using IndieGogo and that is funding our contests for 2019. Also, my company BulletSafe Bulletproof Vests donates enough to keep us running (like use of our dumpster and gas money). That’s why you can get free donuts, Gripper-Grabbers, and even shirts by attending events this year. That money will help us go from collecting a couple hundred pounds of trash in 2018 to a goal of 2,000 pounds of trash in 2019. In the future we will try to raise some more funds to make an even larger impact.